The Lord hath been mindful of us. – Psalm 115:12. 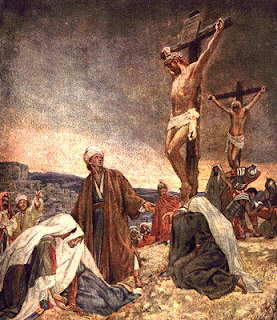 There stood by the cross of Jesus His mother. It is evident what sword now pierced her soul, as was foretold by Simeon (Luke 2:34‒35). And there stood Mary, the wife of Cleophas, and Mary Magdalene. John also stood there. When Jesus saw His mother, and the disciple standing by whom He loved (John), He said to His mother: “Woman, behold thy son!” Then He said to the disciple: “Behold thy mother!” And from that hour the disciple took her unto his own house. – Even in the midst of His suffering and death the Savior did not forget His poor mother. He was mindful of her and provided for her. This is a lesson for children who have parents that are unprovided for. But what is it the Savior once said? He said: “Who is My mother or My brethren?” And He looked round about on them that sat about Him and said: “Behold My mother and My brethren! For whosoever shall do the will of God, the same is My brother and My sister and mother” (Mark 3:33-35). He calls us—who according to God’s will, power, and grace alone believe in Him, and follow Him by faith—His brother and sister and mother. And He is mindful of us; we are His own. “The Lord hath been mindful of us.” When we are in need, He is most lovingly mindful of us, and He provides for us. He is still the same kind and caring Savior. Let everyone comfort himself with this, and cast all his cares upon Him (I Peter 5:7; Philippians 4:6)! PRAYER. – Thy loving heart, O my Savior, is mindful also of me. This I know, in this I rejoice, herewith I comfort myself, and for this I give thanks to Thee. Yes, Thou art mindful of us and will bless us, both small and great. Though we should lose all things, yet will we not lose Thee. Help me, Lord Jesus, to be and remain Thine own; then all will be well in time and eternity. And likewise grant me grace that I, who am Thine own, may consider all others who are Thine to be my brethren and sisters and fathers and mothers, and that to the best of my ability I may help them when in need, as Thou, dear Savior, wouldst have me do. Amen. O mighty King, no time can dim Thy glory! How shall I spread abroad Thy wondrous story? How shall I find some worthy gifts to proffer? Thy woes, Thy mercy, still transcend our wonder. Oh, how should I do aught that could delight Thee!